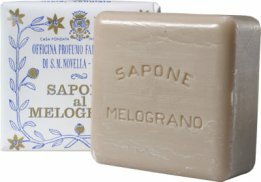 Santa Maria Novella’s Melograno soap (Sapone al Melograno) is available in two sizes, a neat square or a larger rectangle, and its old-fashioned label is decorated with a design of a pomegranate garland. Like all the soaps from Santa Maria Novella, it is manufactured by hand, in a time-consuming but time-tested manner. Each piece is molded with antique soap-making equipment and set aside to cure for two months before it is hand-wrapped, and the soap is triple-milled, resulting in a dense, smoothly textured bar that produces a fine lather and lasts a long time. The Melograno fragrance is unlike any other I know; while it doesn't come across as particularly complex, it somehow manages be soft and lively, warm and fresh all at once. Inhaling the aroma of Melograno soap, I imagine not just the juicy pulp of the pomegranate, but the entire atmosphere of some idyllic Italian pomegranate grove: the fruit's sun-warmed rind, soil-dusted leaves, and crumpled blossoms tipped with a fine powder of pollen. If you fall for the Melograno soap, as I obviously have, you can try several other products that share its fragrance. The Melograno bath salts (Sali da Bagno) are packaged in a simple cardboard canister with a distinctive Baroque label; they contain enough oil to soften the skin, and they fill the bathroom with clouds of Melograno fragrance that linger long after the bathtub has been drained. Santa Maria Novella also offers a Melograno bath oil and dusting powder, neither of which I have been fortunate enough to sample… yet. And lastly, Santa Maria Novella's Balsamo per Capelli, an intensive hair conditioner, is not specifically labeled as a Melograno product, yet it is lavishly scented with the very same fragrance. It is a thick, paste-like cream packed in a glass jar, and its sugar- and wheat bran-enriched formula thoroughly softens and smoothes the hair. Even after it is rinsed out, the conditioner leaves behind an all-day aura of fragrance, which would nicely complement the Melograno cologne but can also lightly perfume the wearer on its own. The Melograno fragrance will always remind me of a trip to Florence in September 2001, including multiple visits to the boutique of the historic Santa Maria Novella pharmacy. Melograno products, and the memories of that trip, have been close to my heart ever since. If you ever have the chance to spend time in that boutique, don't miss it; even if a voyage to Italy is not imminent, however, you may find that these evocatively scented products will become part of your own history. Great review! I'll have to look for the bath salts. I already have more bars of scented soap than I'll ever use, but this one sounds great, too. I guess I could always stash it in the linen closet to make my sheets and towels smell good. Hi Angela! The bath salts really are divine… and I know what you mean about having a soap stash, but if you succumb to buying just one more, the Melograno would be a lovely choice. I love Melograno. I don't really get juicy fresh pomegranate from it, but something more powdery and interesting. The soap and salts are fantastic (my bar of the soap is gone now, but the bar and its scent lasted forever! ), and I'd love to have the candle. Great tip on the conditioner! It is definitely not a typical fruit-juicy fragrance! I love it for that reason, too. And I just used the conditioner this morning, much to the gratitude of my winter-distressed hair. This soap is my all time favorite soap. I caved in a bought another bar yesterday. I feel a bit crazy spending 19 euro on a bar of soap, but this is just the best soap ever. I love the creamy lather, and that smell is intoxicating and rich and lovely. Happilykim, I live in a glass house, so I’m not going to throw any stones! I really do love this soap, too. Just enjoy it!